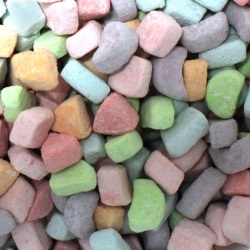 Marshmallow bits in moon, triangle, and rectangle charms. Use as a cake decoration, add to chocolate to make bark, use as an ice cream topping, put them in cereal or add to hot cocoa. Sugar, Modified Cornstarch, Corn Syrup, Dextrose, Gelatin, Sodium Hexametaphosphate, Red 40, Yellow 6, Blue 1, Yellow 5, Natural and Artificial Flavor. Made on equipment that also processes wheat, milk, eggs, soy and tree nuts.